Over the holidays I started 2 hacking projects. This is the first one. Jouvence is a Python library for parsing and rendering Fountain documents. 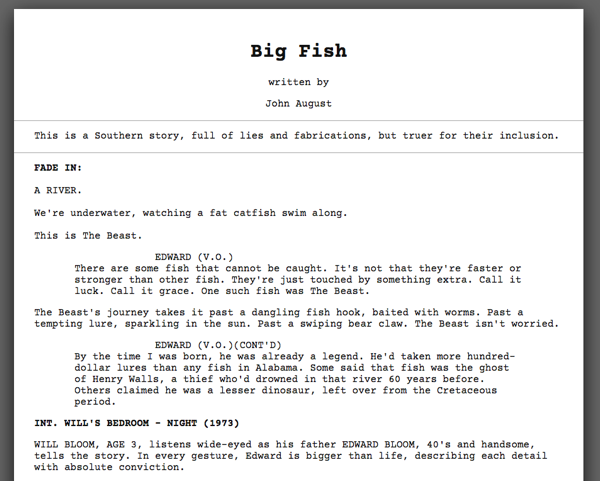 If you don’t know Fountain, it’s basically Markdown but for writing screenplays. It was created by John August, Nima Yousefi, Stu Maschwitz, and a few other contributors – check out the official website for more information. The code is, as usual, on both BitBucket and GitHub. The package is on PyPi. The API documentation is hosted on ReadTheDocs. Of course the whole point of Jouvence is that you write tools and renderers of your own. The Jouvence parser returns a structured document object model that makes it easy to analyze, manipulate, or render screenplays any way you want. For me, this let me add Fountain support to Wikked, my flat-file wiki engine.